Doesn’t this yarn look fabulous? It ranked high among the crafty eye candy for sale at Renegade this past weekend. 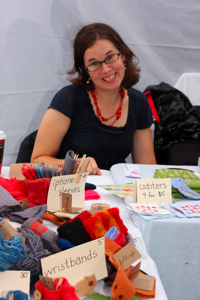 It was fun to chat briefly with Liz Maly, the talented maker of this lovely hand-dyed yarn and other fabulous Felt Cafe goods. 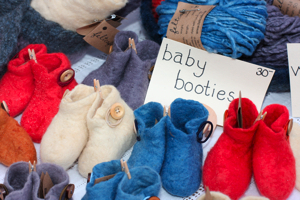 Check out the super cute, felted baby booties. This photo kind of makes me wish my feet were a lot smaller. 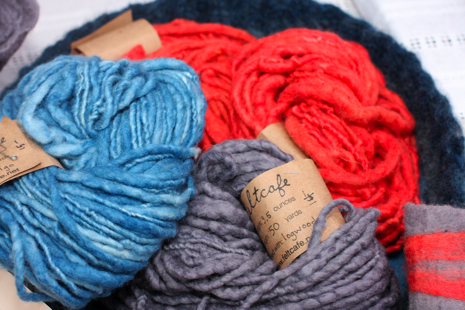 I’m amazed by the vibrant colors Liz achieves with natural dyes. So lovely. The only yarn dyeing I’ve attempted has involved Kool-Aid. I wrote some basic Kool-Aid dyeing instructions for my newspaper craft column a while back. Download the project pdf if you’re feeling inspired to work with dyes you can drink. Howdy! I understand this is kind of off-topic however I had to ask. Does building a well-established blog like yours take a lot of work? I’m completely new to writing a blog however I do write in my diary daily. I’d like to start a blog so I can share my own experience and views online. Please let me know if you have any kind of suggestions or tips for new aspiring blog owners. Thankyou! I and also my pals were found to be looking through the great things on your website then suddenly I got a horrible suspicion I had not thanked the blog owner for those tips. The boys are actually as a consequence thrilled to learn all of them and have now in truth been taking advantage of these things. I appreciate you for truly being indeed accommodating and then for figuring out this sort of outstanding resources most people are really eager to discover. Our honest apologies for not expressing gratitude to you sooner.